The ex-Black Cats chairman was linked with a return to the struggling Championship club earlier this week. 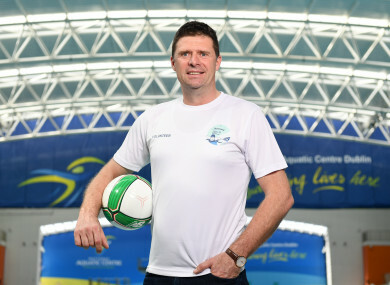 Para Swimming Allianz European Championship ambassador Niall Quinn at the National Aquatic Centre yesterday. NIALL QUINN HAS rubbished reports that he is in line to return to Sunderland. Earlier this week, speculation in a number of media outlets suggested the former Black Cats striker was fronting a consortium that had held talks with current owner Ellis Short over a possible takeover. US businessman Short has made no secret of the fact that he would like to sell the struggling north-east side, who are currently languishing at the bottom of the Championship. Irish football legend Quinn held the position of Sunderland chairman a five-year spell after the Drumaville group took in June 2006, and although the clubs remains close to his heart, there are no plans to go back right now. “I want to see things go well as much as anyone at Sunderland and I’ve been there over the last couple of weeks so maybe that’s where the rumours came from, I don’t know,” Quinn told The42 today. “The people really need something passionate to happen. It’s not me at this point and time, and there is no reason to suggest that will change. “I’d love for something to emerge though, and hopefully they can get a win at the weekend in a tough game at Derby to set up a grandstand finish and get out of it. It’s six years since I was there. I was in for the start of Martin O’Neill’s campaign when he was flying and I wouldn’t have foreseen the fall. A lot of people blame different individuals but it’s the way things turned out. “You can’t rewrite what has happened so it’s all about what happens now going forward. The papers went a bit crazy during the week and I’m really not in touch with exactly what’s happening there. “No, I don’t think that’s going to happen. My family are Sunderland fans and they’re all in a pretty low place at the moment. Like every Sunderland supporter, I would welcome anything positive happening there. “It would be great to see some kind of spark in the next game or two to give the club a fighting chance of staying up because a couple of victories would change everything. 51-year-old Quinn has been out of football since the end of last season, when he opted to finish up punditry work with Sky Sports to get involved with Michael English and Dan Quirke as a director of e-commerce business Global E-Shop Solutions, global influencer-driven retail site FanzFirst and their other platform MoShoppa. It’s more 5am-9pm then your normal working hours, but he is enjoying the challenge. “I had three years left on my contract with Sky, I was doing a lot of flying going back twice-a-week and there were a lot of hotels,” Quinn explains. “I’ve been living in Ireland since 2003 and was travelling over and back, so I just made a decision. I hit 50 and I wanted to get something different done — for my own mind and my own satisfaction. I wanted to bring something up from scratch with the help of other people around me. “I got an opportunity to start a new business with some people who really impressed me. I took the gamble with a start-up and I’m at it everyday of the week. It exhilarating, exhausting and tough but we’re making progress. In my own head and on my own CV, I want to be able to say I did it. Quinn, capped 92 times for the Boys in Green and with 21 international goals to his name, still keeps a close eye on the game. He has been encouraged by the achievements of Ireland’s U21s and U17s this past week, as well as the number of young players involved in the senior team’s friendly with Turkey — despite the disappointing performance. “If I’m getting a kick out of something now, it’s seeing good things happening with younger players,” he adds. “I just hope their progress continues and there’s a big future for the cluster of players who are making their way into the first team as well as those at underage levels. “There are good systems in place here and the FAI needs to get a pat on the back the odd time as they’re doing a lot right at the younger levels. You’ll always rely on getting a few players from England with Irish-themed upbringings as well. I go back to when I got into the Ireland first team and Tony Grealish was there. He was born in London but he was more Irish than anyone. He would be doing all the sing-songs at night so I would say to people questioning players born in England with Irish backgrounds, sometimes you’ll find they’re more Irish than we are. “It’s great news about Rice because you can bet your life that [England manager Gareth] Southgate and his team are keeping at him,” he says. “To see him enjoy it as much as he did is great. “There will be tougher days than he had last week. He was tested a little bit and I thought his organisational stuff was good. From what I saw, I thought he was naturally filling the right positions at the right times off the ball and, on the ball, he looked very assured. Email “'It’s not me' - Quinn shoots down speculation of Sunderland takeover”. Feedback on “'It’s not me' - Quinn shoots down speculation of Sunderland takeover”.